Texas Sen. Eddie Lucio Jr., talks to a witness during a meeting on housing affordability by the Texas Senate Committee on Intergovernmental Relations Thursday, May 31, 2018, at the Pharr Events Center. PHARR — A committee of Texas state senators fielded testimony Thursday from leaders in the Rio Grande Valley, and across Texas, in hopes of better understanding issues that affect housing affordability. 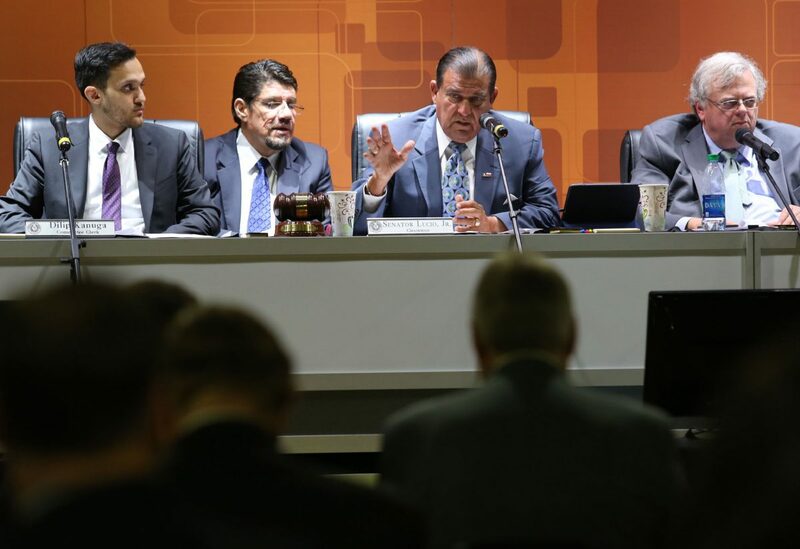 The hearing, chaired by state Sen. Eddie Lucio Jr., D-Brownsville, invited the officials and the public to the Pharr Events Center Thursday for a hearing to inform the Senate Committee on Intergovernmental Relations about local government taxes, fees and mandates. Rising housing costs across the state have caused debate, with some in the Texas Legislature laying blame with municipalities while some cities have condemned those at the Capitol. McAllen Mayor Jim Darling, who testified alongside Pharr Mayor Ambrosio “Amos” Hernandez and Harlingen Mayor Chris Boswell, has placed blame on state leadership in the housing sector, and his claims on Thursday were no different. Darling disputed the charge, too. “What your charge is all about, I think, is restrictions that cities place on buildings.” he said. State Sen. Jose Menendez, D-San Antonio, said he sympathized with Darling. “You pass rules to protect the quality of life, sometimes, in neighborhoods,” Menendez said. Huffines, however, disagreed with Darling, and had some questions for the three mayors. He asked how they fund affordable housing programs, perhaps with voting fees. Huffines had a larger point. As the conversation continued, Huffines asked if the mayors conduct cost-benefit analyses when implementing new building codes or any regulations on builders. Boswell said how his constituents and local builders will call his cell phone if there are impeding regulations. Hernandez said all the cities know what the others’ policies are, and that Pharr, at times, brings in third parties to evaluate specifics. “Really, I think one of your committee’s charges should be to go back and look what state mandates cost developers,” Darling said. Huffines said he appreciated the mayors’ points. Beyond the three mayors, the committee heard from groups across the Valley and the state, including representatives from Texas A&M University, the Texas Association of Builders, Texas Public Policy Foundation, Texas Municipal League, Alamo Area Council of Government and the Community Development Corporation of Brownsville. Ultimately, Lucio wanted to impress a collegial mood on everyone participating in the hearing.